Cabous was born in 1965 in Cape Town, the second son and youngest child of Henno and Susan van der Westhuizen. His early years were unremarkable, but he was an active boy and enjoyed rugby and the outdoors.At the age of 19 he went to Stellenbosch University to study Physical Education and upon graduating began his rugby career. most career tries - ninety, most tries in a season - twenty eight, most Currie Cup tries in a season - thirteen (a record shared with two other players), and most tries in a match - four (shared with ten others since 1968 but the only player to do it twice and in one season). For ten years, 1989-1999, Cabous, in his number eleven shirt, was renowned, not only for his tremendous pace, but also as, "... the only guy with long hair in those days. It became my trade mark, so lots of people still recognise me." His two and a half years and sixteen games playing for the Springbok - including the 1995 world cup - became his golden era, "It becomes any guys dream when you play for your national team." But the fame and fortune did not go to his head, which is just as well because the career of a rugby player is not a long one, "There is only a short period of time that one can play professional rugby, because of the physicality and getting injuries, knocks and bruises." Though Cabous does not miss the spotlight, he does miss his mates, "...sitting around the fire, or at a bar, or at home, having a good laugh." The "Price" is right, so is the sushi. The next stage in Cabous's life was working for the recently opened Mr Price as sports and marketing manager. He spent the next six years there and used the experience to start his own clothing business "Pro Stuff" which produced corporate clothing with logos, such as caps and bags. A trip to a sushi bar in London inspired Cabous and an old rugby colleague to start their own sushi restaurant business in Umhlanga, just north of Durban, and so "SoSushi" was born. Another, called "Sumo's Sushi bar", was soon to follow, this time in a place called Morningside. They were both very successful and the menus included such delights as lime-dressed prawn and litchee salad, bamboo rolls, salmon and tuna roses, crab California with pecorino cheese and Sauvignon Blanc from Raka - for lovers of good wine. In 1994 Cabous met Moira, an "animal crazy" chartered accountant whom he was later to marry. It was on a holiday to Mauritius in May 2008 that they fell in love with the country and decided that they would like to live here.They were attracted by the friendly people and more basic lifestyle, as neither of them are particularly materialistic. They also consider Mauritius to be a good place to raise children, which is something they plan to do in the future and have adopted a local dog "Zoë" as a companion for their two Jack Russells, Merlot and Uzzi. 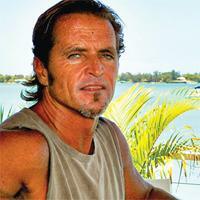 By October they were back in Mauritius and Cabous was working on his new business, the Beachhouse restaurant and bar. It was a major undertaking and is still an ongoing project, for example a tarpaulin is soon to be added to the roof to provide shelter from the sun and rain. Despite the workload, Cabous has found time to invest in the local community, which is something he considers to be very important. He sponsors a local rugby side called the Northern Pirates and coaches the Under Fifteen and the First teams. He has also sponsored the Anti Drug Squad in Grand Bay, for their purchase of soccer kits. But there is more, as part of the South African Rugby Legends Association he plans to help under privileged areas in Mauritius by building community centres, complete with rugby or soccer pitches and spotlights. Cabous is undoubtedly a very likeable person and he has already made some good friends on the island. A taste of his true nature became evident when I asked him what he would like to be remembered for, "I was privileged to be part of a successful [rugby] side, but I don't want to be remembered as a rugby player. I would like to be remembered as a person who lived life to the full. A person who was loving, caring, fair, a people's person."